2003 Nissan Altima - Nice looking, reliable car. I purchased this vehicle in 2012 with 87,000 miles on it, and have added 23,000 additional miles with no irregular maintenance. This is a daily use vehicle and has been very dependable in running errands and Sunday driving, with an occasional long haul trip. Steering and breaking are very responsive, and engine response has been good overall, but occasionally seems to drag. The interior is very spacious and all features still work with everything the driver needs accessible without too much contortion. As I approach higher mileage, I am concerned about other reports of the catalytic converter crapping out and potentially killing the engine. Gas mileage has been consistent throughout seasons and runs relatively smooth for the most part. The vehicle sits a little lower than I am accustomed to, but has a very nice appearance overall and has maintained its integrity very well with no rusting on the exterior. Regular maintenance has included oil changes, brake pad replacement a new battery. Steering radius is a little large for a vehicle this size, but otherwise a comfortable and, most importantly, a reliable ride. I enjoy touring in the country through state parks with the windows down. Appearance: This vehicle has a very smart appearance with nice lines and curves. The color is still clear and has not suffered too many abrasions, nor is it flaking off anywhere. Spaciousness: I am above average in height and find this vehicle has enough leg room in the driver's side and doesn't pinch the legs between the console and driver's side door. Trunk has a lot a room and can be expanded by lowering the back seats. Driving: Steering and brakes are still very responsive. Engine handles well for the most part, and can accelerate quickly. Maintenance: I have not required any extraordinary maintenance, or breakdowns. Features: Both side mirrors can be adjusted internally. Air conditioning works well, but is seldom used. Radio works well enough. In mountainous territory reception can be problematic, naturally. Ding alarm signals when front lights are left on. Mileage: Good and consistent gas mileage with slightly above (32 psi) recommended (29 psi) inflation. Other: High visibility from driver's side on most roads through windows and mirrors. Has handled 100 degree variations in seasonal temperature very well. After purchasing this 2005 Nissan Altima LS used at a local dealership I have been very pleased with my purchase. 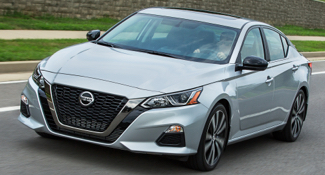 The Nissan Altima has quickly become my favorite car and if given the opportunity I would recommend purchasing a Nissan Altima to my friends and family. Since purchasing the Nissan Altima I have realized how many other people in my area drive cars that are identical to mine. At my job there are at least 5 other employees who drive the same make, model, and year car as mine which makes it difficult to find your vehicle. I have had to place a monogram decal on my rear window after trying on multiple occasions to get into the wrong car! 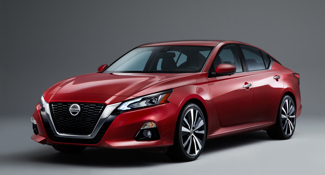 This Nissan Altima has several features that I love. One of the things I love about this car is the amount of storage space. In the dash, between the seats, seat backs and in the doors there is so much storage. I have room to store all of the necessary items that I might need from day to day. Another pro with this vehicle is the smooth ride and quiet motor. There are times when I am stopped at a traffic light that I question whether my car is still on because the motor is so quiet. Being a caterer and baker this car gives me ample room to transport cakes and other dishes. The trunk is large and spacious and the backseat provides a lot of room as well. The backseat provides lots of leg room and the seats are comfortable as well which is especially important for long car rides. The main complaint that I have regarding this car is the quality of the body and frame. One of the cons of this model is that the floorboards tend to develop rust and wear out. There is a small spot in the driver side floorboard where you can see the wear and tear has worn away a small spot in the floor. One other con about this model is it has been difficult to find replacement body parts such as a new door handle and side view heated mirror. I liked this car very much. It was very attractive and the color was different - it was black, but in the sun a deep dark maroon. It was so much fun to drive because we got a lot of compliments on it. Surprisingly, for being a sports car, it was really comfortable in long drives. We drove this little car to South Carolina for a Navy Reunion, then down to St. Pete Beach to visit one of our sons. We then drove down to Naples to visit a friend. There was one problem and that was because I fell one night on vacation - I did not go to the doctor, but learned later that I had two fractured ribs. At our friend's home, we took her out for dinner. We drove and let our friend sit in the front seat because she has back problems. I sat in the back and it was so painful because of the fractured ribs that I did not know at the time I had. Other than that issue, the car was a good one. We never had to replace anything on this car. It drove really well for this little car. We got great gas mileage, which was a huge plus because we drove this car on several trips. Another good thing about this car is that it was so easy to park in small places. Being a sports car another negative about this car was the fact that our automobile insurance premium went up quite a bit. We didn't keep the car really long because after my broken ribs, I talked my husband into getting a 4-door luxury car. When we first bought this car we were driving around. We were talking about how happy we were to have this beautiful car. My husband decided to stop the car and we started kissing...we were not parked very long when a police officer pulled up behind us. He knocked on our window and scared us at first. He said he just wanted to be sure we were alright. The Nissan Altima was a beautiful car! We loved driving around in this car because we got so many stares! The color was black, but in sun it appeared to be a dark maroon color. It was really a gorgeous car. The gas mileage on our Altima was really good. We actually got about 37 miles per gallon, which we felt was really good on a sports car. We had no problem with the running of this car. We never had to change anything on the car, except the oil. We put a lot of miles on this car because it was so much fun to drive. We usually fly when going on a vacation, but we liked this car so much that we would drive it all over the country! This car, being a sports car was very small, but it drove like a luxury car! We kept this car until the 2015's came out - and we only got rid of the car because I had broken two ribs and it was very uncomfortable for me at that time. This car was nearly like driving a luxury car because it was loaded with everything. Leather seats, GPS, great stereo, heated rear seats, etc. At that time, we could not have wanted a nice and more comfortable car. We sold this car that I was 70 and my husband was 72. I guess it was time for us to get an older folks car, so that is what we did. The digest negative about this car had to be when I fractured two ribs. I had to sit in the back when we had company and it was so uncomfortable. I had to bend a lot to get in and I was in pain with the ribs, so that even worsened the pain. With this car being so small, it was a little difficult to pack for a vacation because there was not a lot of room in the trunk. Of course my husband liked that because I had to pack with much less clothes like I usually do. We did have to hang some of my clothes on a clothing rack we put up in the rear of the car for a lot of my clothes because not much room for extra suitcases in the trunk. Another negative about this car is that whenever we went with friends. It was so hard for anyone to get into the back seat. One of our friends nearly fell getting in because his foot got caught in the seat belt. There was just not much room for four adults in that little Altima. Another thing that we was not really happy with is the fact that this is a sports car - and when we changed our automobile insurance to this car, we were shocked! The premium went sky high! We decided to buy a four door luxury although my husband was not real happy to do that. But after we started looking for a new car, my husband and I both fell in love with the car that we purchased - a brand new Avalon - a car that is pure luxury!